Leftover iDli can be converted not only into SEdAram as already discussed but also bajji over gravy. 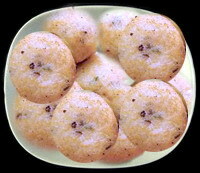 We can use the iDli or dOSA batter to prepare Mysore BONDA or the leftover iDlis and dOSAs to prepare crispy pakOrAs. To prepare the iDli bajji, first cut the iDli in convenient size. Now prepare thin batter with a little maidA mixed with equal quantity of corn flour, a little chilli powder and salt to taste and then dip the cut pieces and fry. Keep aside. Prepare gravy with tomato and other ingredients as discussed earlier and pour the gravy over the fried iDli pieces and serve after 5 to 10 minutes. You may garnish this with chopped coriander leaves. Mysore BONDA can be prepared from iDli or dOSA batter by adding a little maidA and corn flour to thicken the batter a little more. Add grated coconut or small coconut pieces, pepper by breaking the corn into halves approximately without too much pounding, chopped coriander leaves and asafoetida. Mix well and fry in small dumplings in oil so that you get small round balls, which need a little experience. To prepare crispy pakOrAs, break the leftover iDlis or doSas into small pieces and keep in a bowl. Add two or three bread slices after removing the corners. Sprinkle some water and then mix well by hand. In place of bread slices, you may add a boiled potato after mashing it. Add finely cut green chillies, finely cut onions, chopped coriander leaves and salt to taste. Mix everything. Make small dumplings. Dip this in a thin batter prepared with a little corn flour and maidA as above and fry. 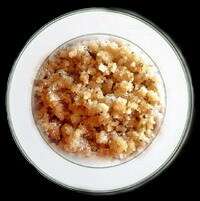 Also puLi uppumA from leftover dOSA with tamarind juice or tomato. In most of the hotels in those days (even today) they do not waste the excess items left over and make use of them in preparing a special item called MUSu uruNDai. 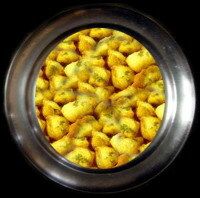 The solid items like vaDA, bONDA, iDli, dOSA, capAtti, parOTTA, pakOrA etc when left over are refrigerated. Next day they are all broken into small pieces and a little water is sprinkled over these. Then either Bengal gram dAl flour or corn flour is added a little to bind them. They are well kneaded after sufficient quantities of cut green chilli pieces/red chilli powder, onion pieces, coriander leaves are added with salt to taste and a little asafoetida powder. Then the mass is divided into dumplings of required size or flattened before frying. After frying they taste very nice as if they are made from fresh materials. 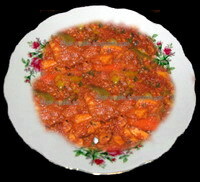 If necessary, you may add some vegetables like potato, carrot, capsicum etc also to enhance the taste. You can show your creativity in this by using garam maSAlA powder, cumin seeds, dried fenugreek leaves (KaSUri mEti) etc. For side dish, you can use the SAmbAr, raSam and other liquid items left over and recycle them with a little tomato, green chilli and onion. You can also recycle the leftover chutney. There is another way of using the solid items. 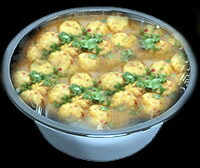 This is done in preparing the famous vaDai curry which we will discuss in the next session. This entry was posted on December 4, 2013 at 5:16 pm and is filed under Recipes from leftovers with tags crispy pakora, dosa, idli, idli bajji, Leftovers, musu urundai or dumpling, Mysore bonda, PuLi uppumA, vadai curry. You can follow any responses to this entry through the RSS 2.0 feed. Both comments and pings are currently closed.